The acoustics folks are meeting in Paris this week for the Acoustical Society of America's (ASA) 15th annual meeting, and I'll be covering all the coolest (er, what I deem as cool) research here on the blog. Simply put, acoustics is the study of sound. But the field is widely diverse and aside from music, applied to countless other areas like oceanography, architecture, and medicine. In one of the many interesting papers being presented at the conference, German scientists designed an experiment to test whether different colored images influence how loud a sound is perceived to be. Visual and audio stimulation often go hand in hand, for example, as you glance at car driving down the street you also likely hear the noise its motor makes. The authors had participants look at pictures of red, light green, blue, and dark green sports cars while listening to the sounds of an accelerating sports car. 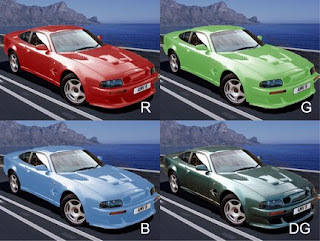 Based on participants ratings, the study found that the sound coupled to the red car was perceived to be about 5% louder than the same sound coupled to a light-green car. Interestingly enough, dark green cars seemed louder to participants than light green or blue.